Sat next to Kaspian, Joe, Kim, Claudia, Sandra, Maddie, Jake and Charlie at the Bernie Grants Arts Centre where the Headstarters are putting on an evening of film, poetry, debate, workshop and discussion around the theme of the Olympic Truce. Where did the concept of Truce originate? Lord Michael Bates who has walked thousands of miles in his search for a real 21st Century pledge for Truce has just shared his knowledge and his vision for Truce for London 2012 in a short film. Plenty more films and animations being screened by some young people from the Host Boroughs who have worked with artist Janette Parris, funny and thought provoking..films from Grennan and Sperandio and some students from Barking and Dagenham, Performance Poet James Massiah has written a special piece for the event which we’re about to watch, Constant Pictures filming, SMJ’s blogging and tweeting about it, Photographers capturing the event, and the Create Programmers putting on the whole evening, with our very own Kayo Chingonyi hosting. 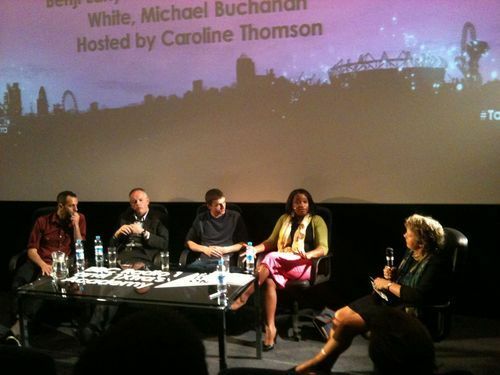 Joe sat on a panel alongside an impressive cast list of professionals: BBC’s Michael Buchanan, ITN’s Charlene White , SMJ mentor and Guardian journalist Benji Lanyado all hosted by the Deputy DG of the BBC Caroline Thomson. Joe really held his own up there and took part in a rich discussion and Q&A with members of the audience about what it takes to become a successful journalist, – or at least on the way to becoming one, in Joe’s case – how persistence, perseverance and passion (the three P’s) are the root of finding you way, and as Charlene White put it having a “thick skin”. Don’t be afraid of rejection, and “do not let anyone tell you you are not good enough!” Benji added, “Make sure you do your research – well!”. Good stories are at the heart of it and telling them well and succinctly was good advice from Michael Buchanan who has a litmus test he uses for good journalism .”If you can’t tell a story in 20 seconds then either you’re not telling it right, or it’s not worth telling” ..
Much more ground was covered, including being prepared to keep irregular hours and miss out on some social activities for the sake of the job, and Caroline T highlighted the importance of remembering to keep the balance right and how as a woman in journalism it can be tough sometimes, especially when having children as well as working become a priority.. Both Bianca and Claudia from the SMJ’s were in the house so watch the SMJ page for more posts about this . 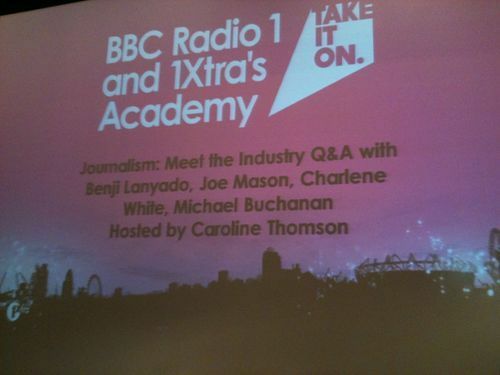 .BBC Radio 1’s Academy runs right through up until 22/6/12 in the run up to the BBC Hackney Radio 1 Weekend. So many things to be proud of the SMJ’s for of late. Not least Joe Mason who’s photos of the interface between Olympic Park and the local community caused quite a stir when he posted them in a recent blog post. at their recently opened exhibition Politics & The Olympics entitled ‘The Other Side of the Fence’. Joe had to get up and speak in front of about 200 people about what his brief was and what he experienced that day in February when he and fellow SMJ, Kaspian went out armed with just their smart phones and Joe’s camera. Bianca, Sandra, Maddie, Joe and Kaspian all interviewed and posted, alongside a really good turn out of other Headstarters. 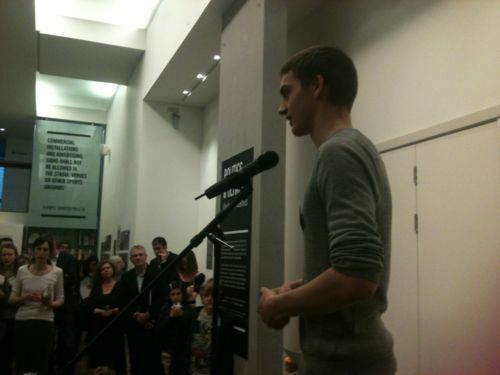 More on the Freeword opening and some audio clips to follow. In the meantime, check out our SMJ homepage for more blogs and reports of the night .. and the very latest views from one very switched on group of young londoners. The last month has gone past in a bit of a blur with not one but two trips around the Olympic park, plenty of speed blogging, and interviewing practise, a Headstart Event at Discover Young Hackney which was deemed a resounding success on all fronts!, and, I’ve been meaning to post this piece of audio for a while, our very own SMJ Bianca Manu, was interviewed on the Nick Ferrari’s Breakfast Show on LBC to give her views on the continuing olympic ticketing – or lack of them! – saga. 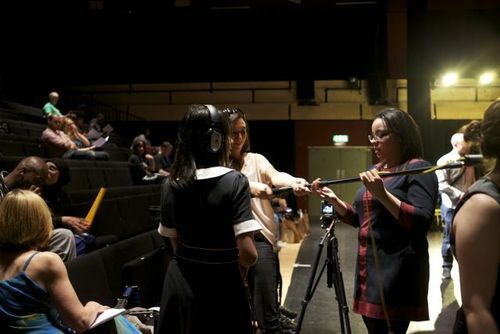 As well as asking Bianca’s opinion – as a young Londoner – on the ticketing issue and whether she views it to have been a fair process or not, NIck also gave her a bit of a grilling. You can listen to the audio here. 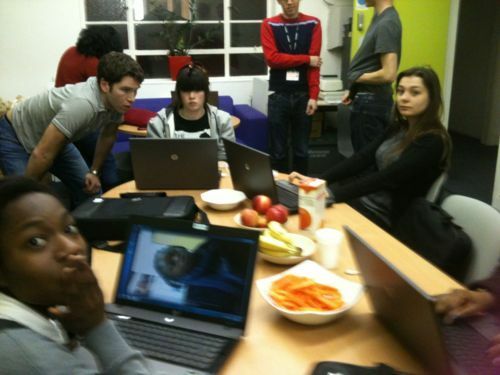 Speed Blogging, SMJ tweets and Olympic challenges.. The past two SMJ sessions have been fast and furious, with blogs aplenty and no shortage of things to talk or should I say blog about! This involves an Olympics related story – we’re awash with them, literally, – an unsuspecting SMJ, and a stop watch.. So far Jake, Joe, Bianca and Claudia have all had a go, with Claudia coming in fastest in 6,24” last night with a nice blog about the recently unveiled bid for Games in Madrid 2020 and its hotly debated logo who’s going to beat that next time?! We’ve also got nearly all SMj’s signed up on Twitter off the back of a few top tips for Tweeting from Producer Chris. And, no shortage of exciting offers and opportunities, most notably, the marvellous Free Word Centre on the Farringdon Road, who have taken the SMJ’s on as their young representatives. Last session, we had a visit from Stephen Escritt, Producer of forthcoming exhibition ‘Politics & The Olympics’ at The Free Word Space May 1st – September 9th, a look at the history of the Games and politics through 40 iconic photographs .The SMJ’s even have their very own commission, to find or take a photograph of their own to be part of the exhibition bringing us right up to the present day, a view of the Games, from a young East Londoner’s perspective..deadline for these images is Feb 27th, watch this space! What’s a BLOG? Simple definition: It’s a conversation. I have been asked by the good people at The Learning Trust in Hackney, to deliver a How To Blog workshop tomorrow, as part of a programme they are running for some young Olympic Ambassadors from 52 School’s in Hackney. One of the SMJ’s Jake Morgan-Stead, has kindly agreed to come along, so that he can show them first hand, what he’s been doing with his blog for the past couple of years, since he got involved with being a Social Media Journalist and The Headstart Programme, courtesy of AND. 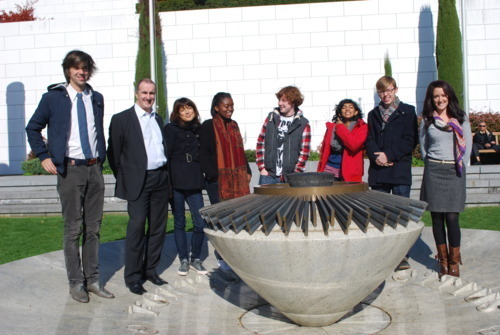 Here’s a picture below, which includes Jake (second from the right) with a group of us on a trip we made to The Olympic Museum in Lausanne, Switzerland, back in October 2011. By the end of the session tomorrow, (just 90 minutes) our brief is to have got this group of about thirty, 11 year olds, to understand, a) what a blog is and b) to have set up and posted their own set of blogs to include, linking and photos, and some multi media content. They will then regularly post about what they get up to between now and the end of the Ambassador’s project at the end of July and the beginning of The Games. Their objective? to produce a 2012 themed edition of ‘Success in The Making” newsletter, which will then be distributed to 36, 000 people in Hackney!